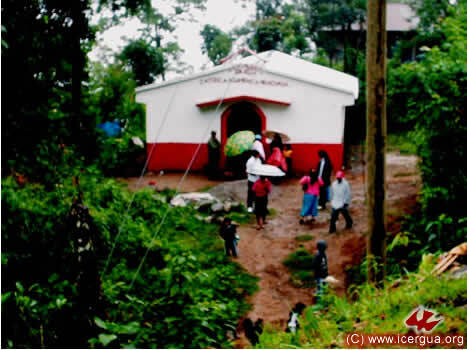 Since January of this year, several small communities of ICERGUA have begun in the Department of Sacatepéquez, specifically in the villages and communities around Antigua Guatemala. One of these communities is in San Juan Gascón. 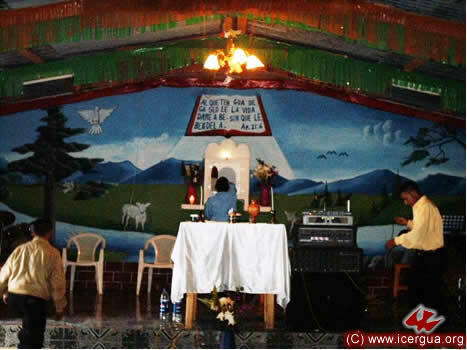 Brother Raúl López has made a house available to the community, where a small chapel has been installed and instruction in the catechism is being given. In the evening of Sunday, June 7, our bishop visited the community to encourage its members in their work and to bear witness to the presence of the Kingdom. Taking advantage of the fact that on the 7th, 13th and 14th there was a change of plans from the original calendar, our bishop along with some seminarians made a pilgrimage to five of the highest peaks in Guatemala: Sunday, June 7, they were at the peak of Yepocapa (3850 meters above sea level), and the volcano Acatenango (3996 meters). On Saturday the 13th it was the volcanoes Zunil (3540 meters) and Santo Tomás or Pecul (3008 meters) and on Sunday the 14th, the volcano Santa María (3768 meters). On two of the summits the Holy Office was sung. 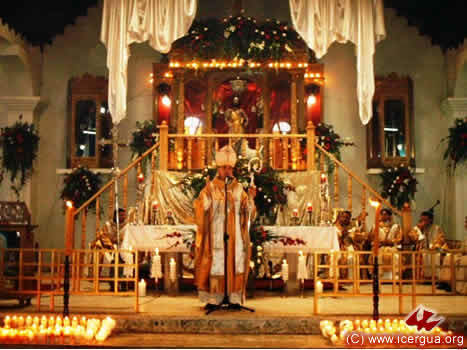 On the other three Eucharist was celebrated, giving thanks to God for the blessings received and asking for grace for the whole world, and in particular for the members of ICERGUA. above: Arriving at the top of Yepocapa. Behind the bishop are seminarians Federico and Oscar (both K’ekchí, from Sesaquiquip, San Pedro Carché). 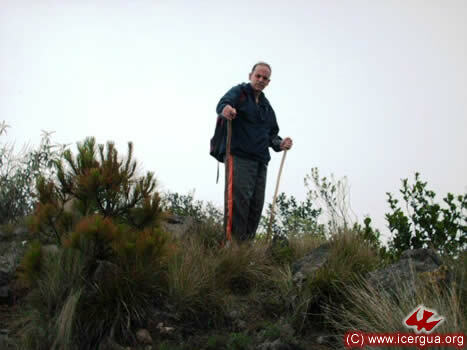 Also Baltazar, from Nucá Barillas, who took the photo, and José Luís from Siglo XIX, Barillas, made the climb. 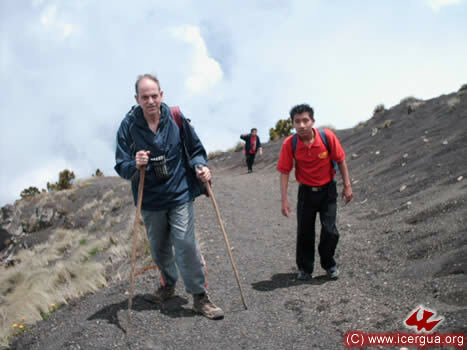 left: The bishop after arriving at the peak of the volcano Zunill. On Friday, June 12, during the afternoon, as part of the regular ministry to the communities of ICERGUA, Mons. Eduardo visited the communities of Tzununá and Jaibalito, both on the banks of Lake Atitlán and part of the municipality of Santa Cruz La laguna. The bishop was able to witness the rapid growth that the community in Jaibalito is experiencing. 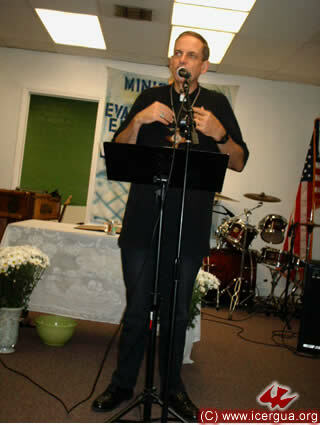 Full of enthusiasm, all the people are committed to the work of evangelism, and it is bearing abundant fruit. JUNE 15: MEETING WITH THE CATECHISTS DIRECTORS IN SAN JUAN COMALAPA. On Monday, June 15, the team coordinating instruction for the catechists of San Juan Comalapa visited the bishop to invite him to give an instructional retreat for all the catechists in order to solidify them as a group in their mission and to deepen their knowledge of ICERGUA. The retreat will take place in the Cathedral on Saturday, July 11. It is beautiful to see the enthusiasm with which the brothers are working and trying to carry out the coordinating ministry that has been entrusted to them. JUNE 17: VISIT FROM THE NUNS OF THE ORTHODOX CONVENT OF THE MOST HOLY TRINITY. On Wednesday, June 17, at midday, our seminary was blessed with the visit of three nuns from the Orthodox Convent of the Most Holy Trinity—the Abbess, Mother Inés, and sisters María and Ivone. They joined us in singing the Holy Office and then had lunch with us. Then they left for Moscow, where they are meeting Patriarch Kiril and taking our greetings and sense of deep communion with them. From June 16 to 19, the four candidates for the deaconate, who are doing their EPS (supervised pastoral practice) were at the Seminary to present their thesis on humanistic topics and to take their comprehensive philosophical-humanistic examinations. Although with varying degrees of success, the four candidates were approved: Juan Moisés Mendoza Sapalú, who is assigned to Barillas, Huehuetenango; Marcos Caicedo, who is assigned to Uspantán; Felipe Corimanya, assigned to Santa Eulalia and Gildardo Ramírez, assigned to Tzanixnam, Totonicapán. With the approval of these examinations, direct preparation for the deaconal ordination begins. Their academic work continues as they proceed to prepare their pastoral thesis and study for the comprehensive theological-pastoral examinations, which they will take at the beginning of October. 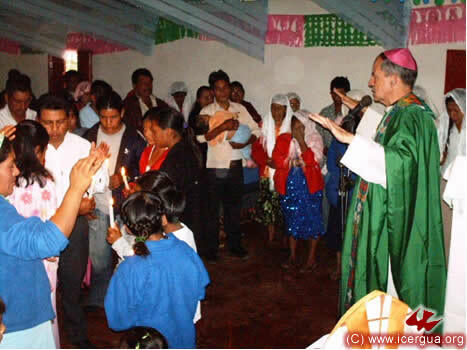 On the afternoon of Friday, June 19, the bishop visited the communities of Pajomel and Chuitzanchaj. 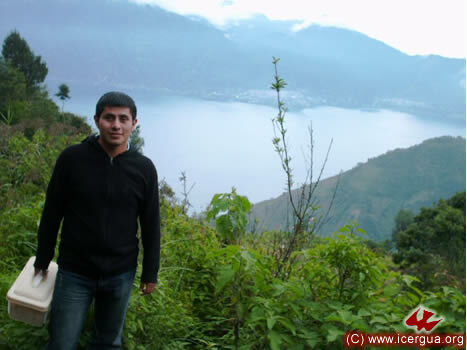 Both of them are on the upper part of Lake Atitlán and belong to the municipality of Santa Cruz La Laguna. left: The beautiful church of Pajomel. It was formally blessed on May 9 by Father Santos Acosta Sol, appointed by the bishop as his delegate for this task. right: Seminarian Juan Moisés Mendoza, who has passed his examinations and has been accepted to be ordained deacon, accompanied the bishop on the way back from the mission. In the background, Lake Atitlán from the road between Pajomel and Chutzanchaj. JUNE 20: CONFIRMATIONS IN SOLOMA. 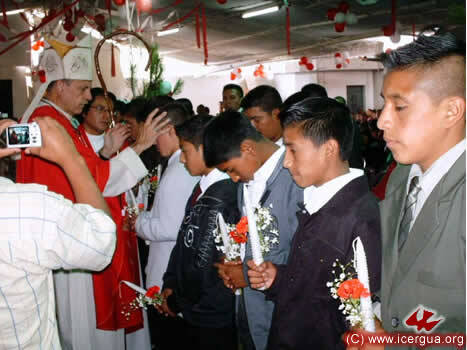 On the morning of June 20, 38 young men and women of the Community of San Pedro Soloma received the sacrament of Confirmation. All of them were prepared with great care for prayer and liturgy, and each of the candidates was confirmed. During the homily the bishop stressed the urgency that each of those confirmed accept the life style and commitment the apostles had. left: Those being confirmed, after they were presented to the bishop. 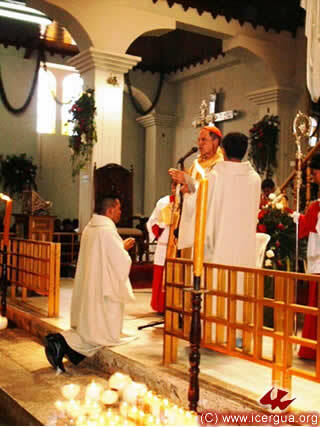 right: Accompanied by Father Fredi Mux, the priest of Soloma, the bishop anoints with the Holy Chrisma one of the brothers who received the sacrament of Confirmation. left: After the young women have been anointed with the Holy Chrisma by the bishop, their sponsors pray for them, asking that the same fruit that the outpouring of the Spirit produced in the Apostles on the day of Pentecost may be produced in each of those who received the sacrament of Confirmation. 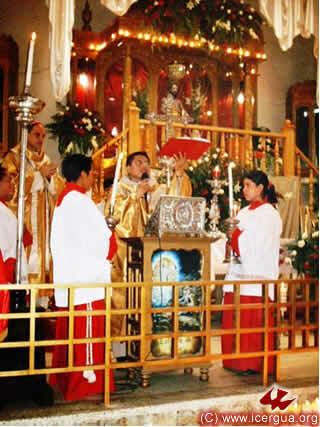 JUNE 20: EUCHARIST WITH THE MUNICIPAL CORPORATION IN SOLOMA. 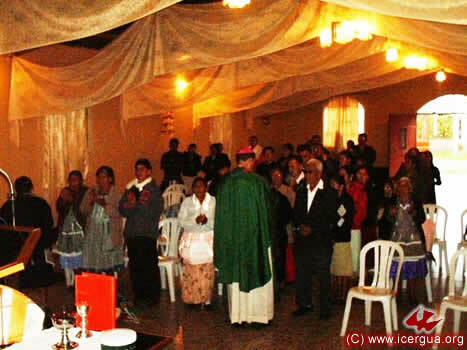 On the afternoon of the 20th, in the see of the Renewed Catholic Community of Ixlahuitz, Soloma, a meeting took place between the bishop and the municipal corporation and representatives of the civil community. The purpose was to exchange concerns and ideas. The atmosphere was cordial, and reciprocal solidarity was expressed. left: After the meeting, the bishop celebrated the Eucharist of Thanksgiving and Rogation for the Municipal Corporation and the whole town, represented by the delegates of the civil community. The photo shows a moment after sins have been confessed and the bishop is declaring absolution for each of those present. 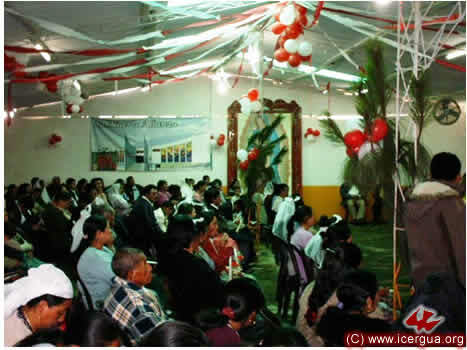 JUNE 20: CELEBRATION IN CHINACÁ, HUEHUETENANGO. 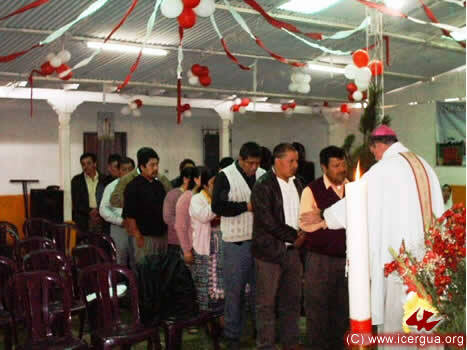 On the same day in the evening, the bishop visited the Community of Chinacá, Huehuetenango, to celebrate a Rogation Mass for the retreat that the young people the community are having on the weekend of June 26-29 in the ICERGUA Center of Pastoral Education, located in the city of Huehuetenango. JUNE 21: VISIT TO EL MONUMENTO, CUILCO. 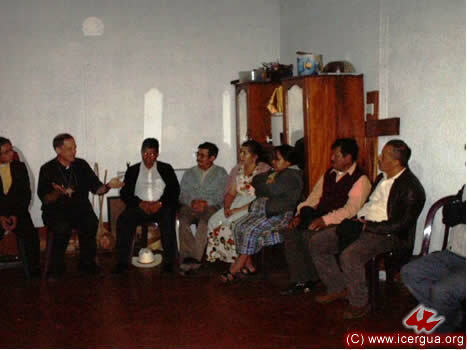 On Sunday the 21st, the bishop made a pastoral visit to the Community of El Monumento, Cuilco, a very distant community. Having arrived at Mesilla (the west-central border between Guatemala and Mexico), one has to travel three and a half hours in a narrow defile parallel to the border. With considerable effort, the faithful have built a small but beautiful church. 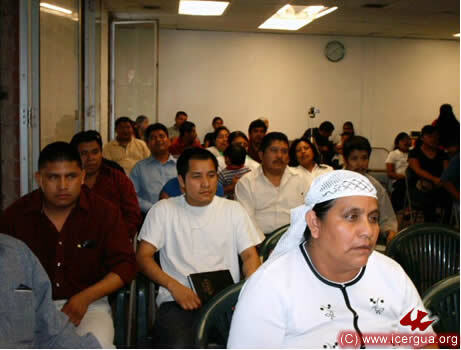 Among those attending were fifteen representatives of a community located in the state of Chiapas, also in the border zone, which felt called to become part of ICERGUA. 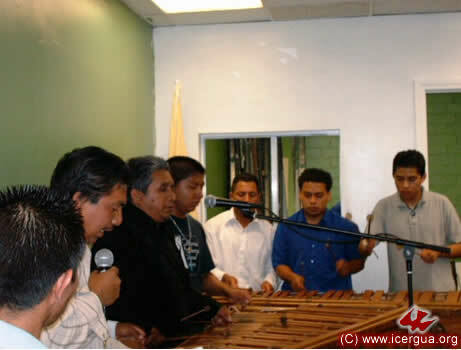 Now we are committed to visit this community and integrate it into all of our ICERGUA undertakings. 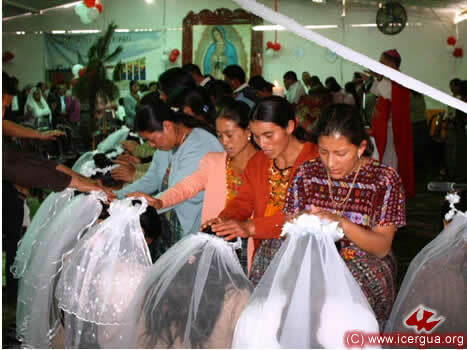 During the Eucharist in El Monumento, six baptisms, four confirmations and a marriage were celebrated. In the photo at right: the prayer offered by one of the sponsors for those who were baptized after the bishop completed the rite of baptism. 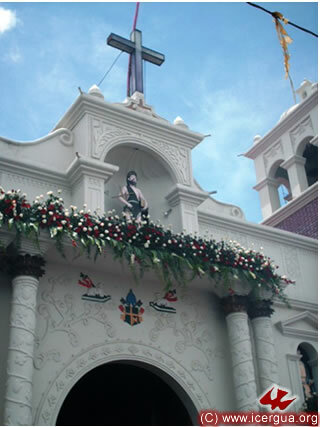 JUNE 24: MASS ON THE PATRON SAINT’S DAY AT THE CATHEDRAL OF ST. JOHN IN COMALAPA. On Wednesday, the 24th of June, the Solemnity of the birth of St. John the Baptist, the bishop presided at Eucharist in the Cathedral of St. John Comalapa. A huge number of the faithful were present in spite of the fact that it was a weekday. The Cathedral was decorated with great care, outside as well as inside. Father Rigoberto Upún and Father Francisco Simón, Vicar General and Vice Vicar General, respectively, of ICERGUA, the priests responsible for the pastoral work of the Cathedral, worked tirelessly during the run-up to the Solemnity so that the People of God might be prepared spiritually. right: A partial view of the multitude that filled the Cathedral. An estimated 2000 parishioners participated in the Eucharist and around 5000 in the procession that followed the celebration. 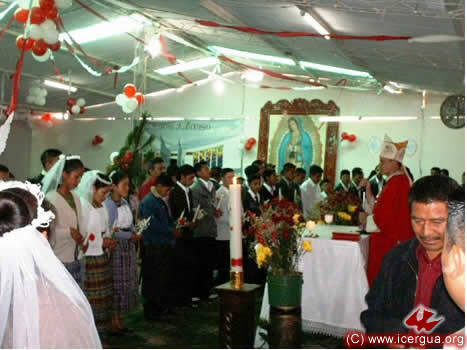 left: Father Francisco Simón, after the reading of the Holy Gospel, in Kaqchikel as well as Spanish, presents the Book of the Gospel to the People of God. right: The homily. Behind the bishop is the elegantly decorated altar of the Cathedral. 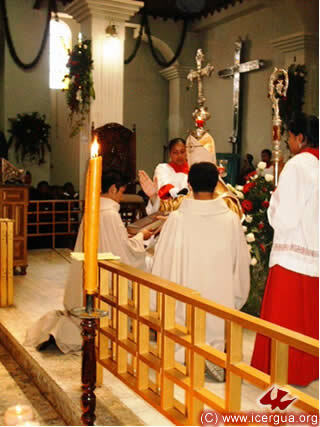 In the back, a partial view of the co-celebrants: at the left, Father Francisco Simón; at the right, from left to right, Father Rigoberto Upún, Fredi Mux and Silas Ferreira. left: An especially emotional moment—the procession of the offerings. Representatives of some of the Communities of the Cathedral made a striking procession. 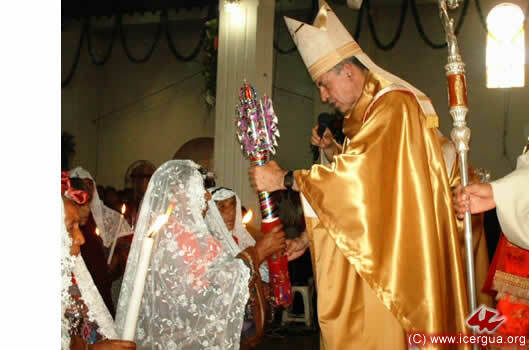 In the photo the bishop is receiving the gifts from the hands of those bringing the offerings. right: At the end of the Eucharist, the bishop delivers to the new “Texel” (captain) of St. John the Baptist the symbol of her charge: a candle that represents the commitment to make the light of Christ shine brightly in her life. In the context of the Solemnity of St. John the Baptist, the bishop conferred minor orders on six seminarians. Five received the order of reader and one that of acolyte. 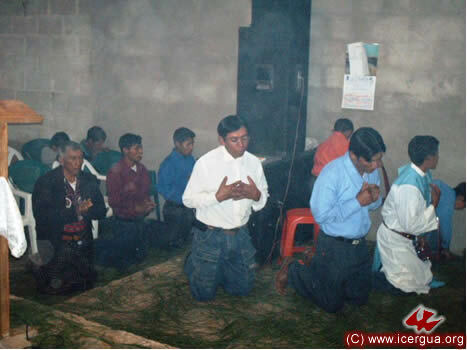 In the photograph, the six candidates are kneeling while the congregation, under the guidance of Father Fredi Mux, sings the Litanies of the Saints. 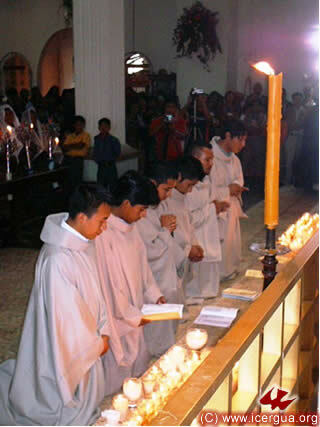 Those ordained, from left to right, are Bernardo Vásquez, Higinio Osorio, Edy Divas, Byron Subuyuj, Yaider Jiménez and Orlando López. Above left: Prayer for those who are ordained readers. 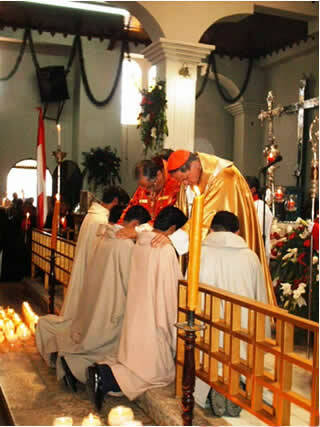 left: Ordination prayer for Yaider Jiménez as acolyte. On the 27th and 28th of June, the bishop was in Los Angeles to lead an educational retreat with the leaders of the three Los Angeles communities that have made an alliance with ICERGUA. Some 30 leaders attended the first day. During the evening Eucharist was celebrated with some 150 faithful who came to participate in the weekly assembly of the El Pescador (“Fisherman”) ministry. 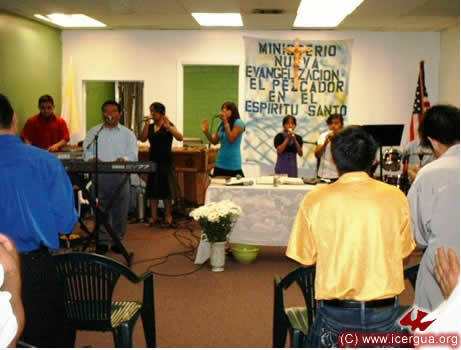 Then on Sunday about 50 faithful participated in the instruction sessions. left: The bishop during one of the six conversations that he gave as part of the educational retreat, which took place in the House of Prayer of the Community of the Fisherman. right: The Fisherman Community has two ministries of music. At the right, the ministry of marimba music. 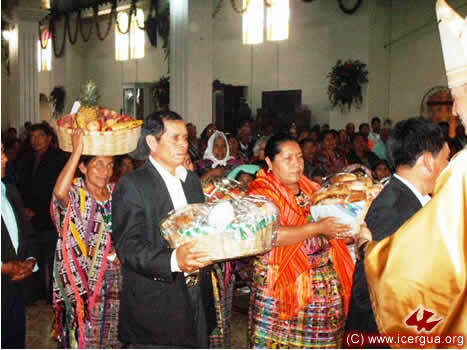 The director is Brother León, who is also the President of the Pastoral Council of the communities. A view of those attending the conference on Sunday. 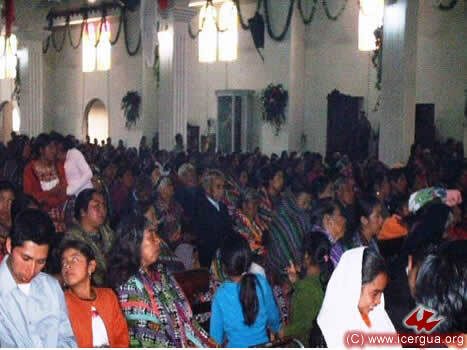 Most of these people come from Barillas, Huehuetenango, and in particular from the village of Nucá. right: members of the other ministry in the Community El Pescador during the refreshment break between two conversations on Sunday.